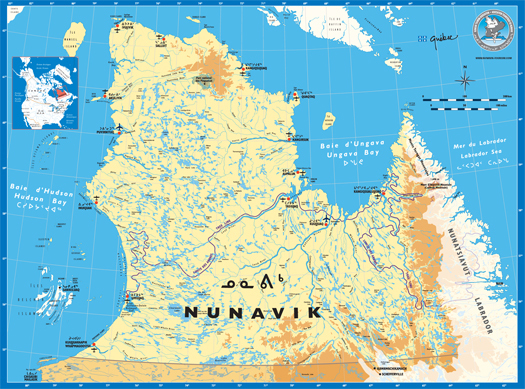 This week - Nunavik: the northernmost region of Quebec. Stretching above the 55th parallel, this 507,000km2 of pristine territory is bordered by Hudson Bay to the west, Hudson Strait and Ungava Bay to the north and Labrador to the east and makes up one third of the province of Quebec, equal to the size of France. Presenting a remarkable display of truly wild tundra, taiga forest, scenic mountains, majestic rivers and countless lakes, this unspoiled region is the ideal playground for nature lovers in search of a true adventure. The famous Pingualuit Crater, a circular lake within the walls of an ancient meteorite strike, now part of one of Quebec's national parks, is only one example of the spectacular scenery that can be found in Nunavik. The region also boasts the highest peaks of Quebec, the Torngat Mountains, also the highest in Canada, east of the Rockies, and soon to become another national park. And speaking of highest, Nunavik can also brag about the world-record-setting tides of the Leaf Basin, which regularly exceed 15 m.
Nunavik also cradles two other gems of nature: the Richmond Gulf, an inland sea surrounded by cuestas (slopes) resembling those of the Grand Canyon, and Clearwater Lake, the second largest natural lake in the province. And let's not forget Cape Wolstenholme, an historic trading post, whose towering cliffs are home to the one of the world's largest colony of thick-billed murres. These natural wonders are not only home to a rich array of plants and wildflowers that blossom in the summer, but also to many birds, including Canada geese and eider duck. In addition you can discover awesome wildlife such as the polar bear, king of the Arctic, various species of whales, some of the largest herds of caribou in the world, and groups of walruses and musk oxen, two of the oldest species left on earth. Not to mention the numerous fish - Arctic char, Atlantic salmon and a variety of trout - that roam in Nunavik's waters. Venturing north to Nunavik is also an opportunity to learn about the vibrant culture of the Inuit people, its legendary inhabitants, and experience their unique way of life. 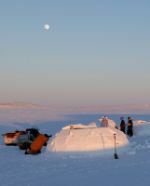 The regionâ€™s adventure operators offer a great selection of authentic Inuit adventures, whether in winter with dog sledding expeditions where one can learn to build an igloo to sleep in beneath the Northern Lights, or in summer with kayaking or canoeing excursions during which one can encounter wildlife from up close and catch a fish that will fuel stories for a lifetime. 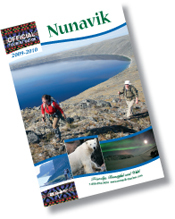 www.nunavik-tourism.com or call 1-888-594-3424 to get a free copy of the Nunavik Official Tourist Guide. Listen to the show this Saturday as there will be two great prizes to win: a fabulous Cruise North Expeditions Arctic Safari for two this summer, with flights courtesy of First Air; and an Inuit Adventures weekend for two in Nunavik this winter, with flights courtesy of Air Inuit and lodging from Co-op Hotels. 1-800-491-CJAD, or *TALK on your cell. Or send your question any time this week by entering the contest here online, by clicking on the Yellow "Enter Contest" button. Inuit-owned and operated Cruise North Expeditions is the perfect way to experience the wonders of Nunavik in the summer. Voted one of the Best Adventure Companies in the World by National Geographic Adventure; these are experiences of a lifetime. With Inuit guides experts of the region visit traditional villages, explore striking landscapes, hike across tundra carpeted in wildflowers, and photograph exotic Arctic wildlife. While on deck, spot your first iceberg, jutting out from the calm, crisp Arctic sea. Learn from scientists specializing in ornithology, marine biology, plants, and history. Your decision to travel with Cruise North directly contributes to the well-being of Inuit and the Inuit homeland. 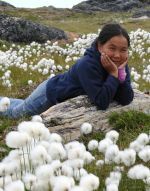 Your hard-earned dollars and time spent with us aids in wildlife habitat protection, community development, and the education and training of Inuit youth. Learn more at www.cruisenorthexpeditions.com or call 1-866-263-3220. Book before January 15, 2010 and get $400 US off per person. NOW is the best time to visit the Arctic. Listen to the show this Saturday for your chance to win a fabulous Cruise North Arctic Safari cruise for two, this summer, July 13, 2010 for ten nights. This is by far the best trip to see the Arctic's Big 5: Polar Bear, Muskox, Caribou, Walrus and Whales. Includes shipboard accommodations, shore excursions and airfare courtesy of First Air from Montreal to Kuujjuaq, returning Iqaluit to Montreal. Inuit Adventures is a division of La Federation des CoopÃ©ratives du Nouveau-Quebec, which is owned by its member cooperatives operating in all of Nunavik's communities found on the eastern Hudson Bay and Ungava Bay coasts. Inuit Adventures is Nunavik's adventure tour operator par excellence, offering a wide range of outdoor activities in or around any of the region's Inuit communities. From snowmobiling to dog sledding and igloo building in the winter, and from kayaking or canoeing to hiking or biking in the summer, not to mention the tremendous opportunities for wildlife observation in all seasons, there is an adventure for each and everyone, whether you are a novice or hardened enthusiast, whether it is for a few hours, overnight or for a few days. For more information or to book your very own Inuit adventure in Nunavik, please contact Inuit Adventures by e-mail at inuitadventures@fcnq.ca or call 514-457-9371, ext. 308. Or, if you are calling from outside of Montreal, call toll free 1-800-363-7610. Listen to the show this Saturday for your chance to win an Inuit Adventures weekend for two in Nunavik this winter, including a dog sled outing and a night in an igloo, with flights courtesy of Air Inuit and lodging provided by the Co-op Hotels.